Photo of a wet swale. Courtesy of Limnotech. Wet swales occur when the water table is located very close to the surface or water does not readily drain out of the swale. 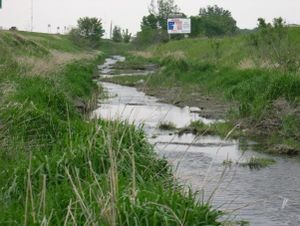 A wet swale acts as a very long and linear shallow biofiltration or linear wetland treatment system. Wet swales do not provide volume reduction and have limited treatment capability. Incorporation of check dams into the design allows treatment of a portion or all of the water quality volume within a series of cells created by the check dams. Wet swales planted with emergent wetland plant species provide improved pollutant removal. Wet swales may be used as pretreatment practices. Wet swales are commonly used for drainage areas less than 5 acres in size. This page was last modified on 21 May 2018, at 08:45.